Gray extended dorm bed skirts are a great addition to any college dorm room. A gray college bed skirt will help you easily match your Twin XL bedding with the rest of your dorm decor. 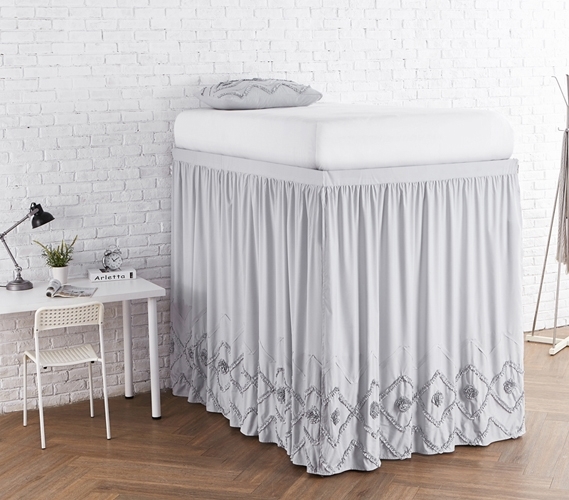 And with our Ruffled Chevron Bed Skirt Panel with Ties - Glacier Gray, you'll get so much more style than just a must have gray extra long Twin size bed skirt. These unique dorm bed skirt panels feature an eccentric chevron pattern ruffled design that will make your Twin XL bedding one-of-a-kind! The look of these dorm bed skirt panels will both blend in with your college decor, due to the gray color, and have an impact on the overall appearance of your dorm room, thanks to the unique ruffled chevron design. These essential Twin XL bed skirt panels will also help you keep your dorm room looking tidy and organized. Even if you use necessary underbed storage items to store your dorm supplies, the space underneath your raised dorm bed can start to look a little cluttered. Adding these stylish gray college bed skirt panels to your raised or lofted dorm bed will help you hide that clutter from your friends when they come to visit!